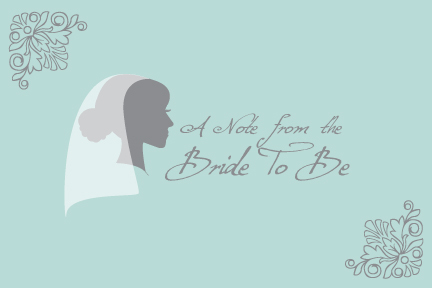 Paper Pearl: Calling all Brides! On January 22, I will be a vendor at my first ever bridal fair. The Bridal Brunch presented by Her Nashville and NFocus Magazine has been providing brides with a one stop shop to wedding planning. I will be there for wedding invitations and am pleased to be the only stationer there! I'm hoping to jump start this little business into a wedding invitation making machine! I look forward to meeting many lovely ladies who want to make a lasting first impression with their invitations. After all, the invitation is the first impression of your wedding you can give your guests. Above is a postcard I will have available for sale at my booth for brides to send sweet messages to loved ones, bridesmaids or anyone involved in the wedding that needs some appreciation! It is always good to send a hand written note when you can. Of course, doing it in a fancy way is even better.